Listener for the SpringApplication running, it defined 5 steps of lifecycle: starting -> environmentPrepared -> contextPrepared -> contextLoaded -> finished. Create the class implemetns the org.springframework.boot.SpringApplicationRunListener and org.springframework.core.Ordered, a public constructor with two parameter SpringApplication and String should be added. A line like org.springframework.boot.SpringApplicationRunListener=IMPLCLASS should be added to META-INF/spring.factories. 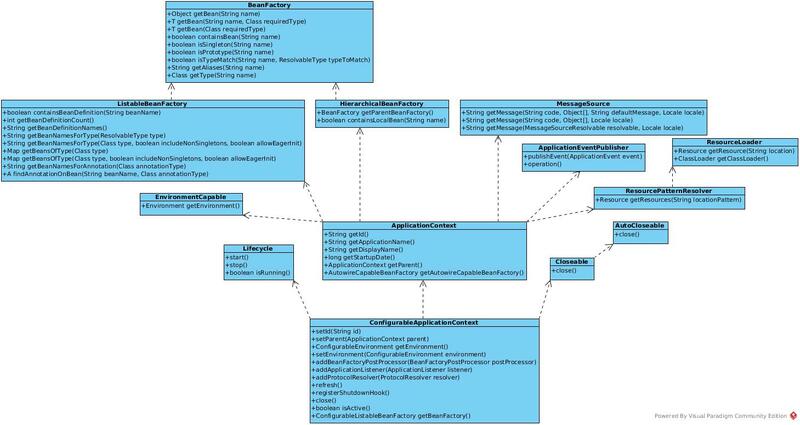 This section contain UML diagrams of Spring Core API. ApplicationContext - Central interface to provide configuration for an application.